Toulouse, 22nd October 2018 – Taiwan’s China Airlines (CAL) has taken delivery of its newest A350-900 aircraft, which features a unique joint livery that combines the airline’s distinctive plum blossom logo with Airbus’ exclusive A350 XWB carbon fibre pattern. Following this delivery, China Airlines today has 14 A350-900 aircraft in its fleet. The airline operates these aircraft on non-stop long haul routes, including services from Taipei to Europe and North America as well on selected routes in the Asia-Pacific region. Since entry into service in 2015, the A350 XWB has established itself as the new long range leader in the larger twin aisle category. Over 200 aircraft are already in service with 22 airlines, flying primarily on long haul routes. Innovations introduced with the A350 XWB Family include the latest aerodynamic design, carbon fibre fuselage and wings, plus new fuel-efficient Rolls-Royce engines. Together, these features translate into unrivalled levels of operational efficiency, with a 25 per cent reduction in fuel consumption compared with older generation aircraft of the same size, as well as significantly lower maintenance costs. 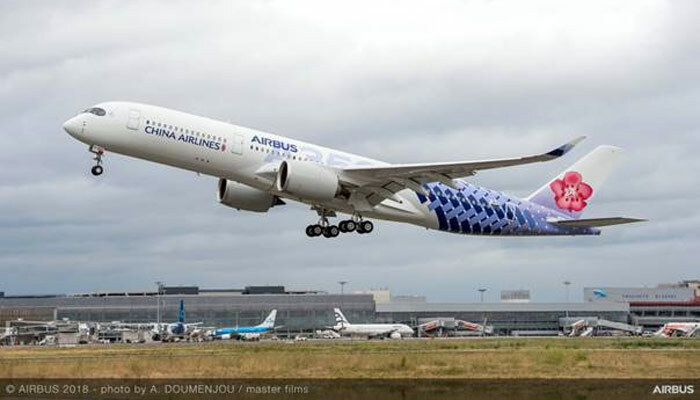 Be the first to comment on "Airbus and China Airlines present A350-900 with special joint livery"